The dramatic increase in average life expectancy during the 20th century ranks as one of society’s greatest achievements. Although most babies born in 1900 did not live past age 50, life expectancy at birth now exceeds 83 years in Japan—the current leader—and is at least 81 years in several other countries including the United States. Even less developed regions of the world have experienced a steady increase in life expectancy since World War II, although not all regions have shared in these improvements. (One notable exception is the fall in life expectancy in many parts of Africa because of deaths caused by the HIV/AIDS epidemic). The most dramatic and rapid gains have occurred in East Asia, where life expectancy at birth increased from less than 45 years in 1950 to more than 74 years today. These improvements are part of a major transition in human health spreading around the globe at different rates and along different pathways. This transition encompasses a broad set of changes that include a decline from high to low fertility; a steady increase in life expectancy at birth and at older ages; and a shift in the leading causes of death and illness from infectious and parasitic diseases to non-communicable diseases and chronic-conditions. In early non-industrial societies, the risk of death was high at every age, and only a small proportion of people reached old age. In modern societies, most people live past middle age, and deaths are highly concentrated at older ages. It wasn’t until the 20th century that mortality rates began to decline within the older ages. Research for more recent periods shows a surprising and continuing improvement in life expectancy among those aged 80 or above. The progressive increase in survival in these oldest age groups was not anticipated by demographers, and it raises questions about how high the average life expectancy can realistically rise and about the potential length of the human lifespan. While some experts assume that life expectancy must be approaching an upper limit, data on life expectancies between 1840 and 2007 show a steady increase averaging about three months of life per year. 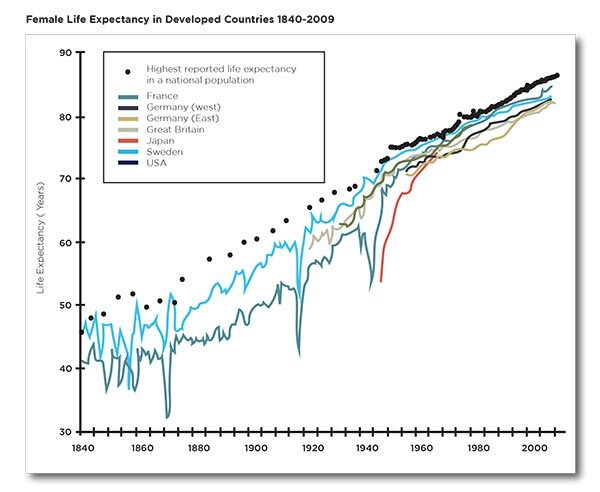 The country with the highest average life expectancy has varied over time. In 1840 it was Sweden and today it is Japan—but the pattern is strikingly similar. So far, there is little evidence that life expectancy has stopped rising, even in Japan. The rising life expectancy within the older population itself is increasing the number and proportion of people at very old ages. The “oldest of the old” (people aged 85 or older) constitute 8 percent of the world’s 65-andover population: 12 percent in more developed countries and 6 percent in less developed countries. In many countries, the oldest old are now the fastest growing part of the total population. On a global level, the 85-and-over population is projected to increase 351 percent between 2010 and 2050, compared to a 188 percent increase for the population aged 65 or older and a 22 percent increase for the population under age 65 (Figure 5). 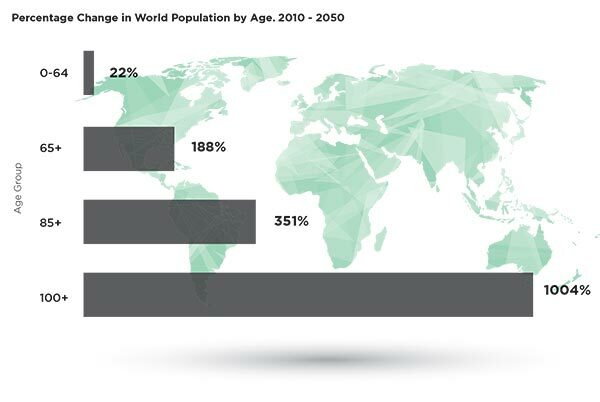 The global number of centenarians is projected to increase 10-fold between 2010 and 2050. In the mid-1990s, some researchers estimated that, over the course of human history, the odds of living from birth to age 100 may have risen from 1 in 20,000,000 to 1 in 50 for females in low- mortality nations such as Japan and Sweden. This group’s longevity may increase even faster than current projections assume—previous population projections frequently underestimated decreases in mortality rates among the oldest old. Almost half (46%) of investors in this country are worried they will outlive their savings in retirement, a recent survey shows. In fact, 36% of retired investors and 50% of investors who aren’t retired are concerned they will run out of their own money so that eventually their main source of retirement income will be Social Security, according to the Gallup survey of 1,011 investors who have $10,000 or more in savings and investments. About 58% of respondents have an income of less than $90,000; 42% make $90,000 or more. The survey was conducted in August 2015. Many people haven’t saved enough, and some lost a lot of money during the Great Recession and have not “healed” from the experience. Many investors are still hesitant to put money in the stock market; even though the market is the best way to grow your savings. The survey found that pre-retirement investors say that about 38% of their retirement savings is invested in the stock market; for retirees, it’s 33%. At WT Wealth Management we talk with many investors and some are investing in the market, but they are doing it reluctantly. In the days when the 10 year treasury could get you a 5 or even 6% yield, investors had alternatives. With the 10-year yielding slightly more than 2% many investors feel they have no choice but to take risks they otherwise wouldn’t. The facts are the facts, with incomes stagnant or dropping, with employment uncertainty increasing and with health care costs skyrocketing, one can only conclude that some level of concern about running out of money is warranted. Another recent survey from bankrate.com found that there are many Americans (55%) with significant savings fear going broke in retirement, but they aren’t willing to cut back on their current lifestyle to save more for the future. The Gallup report found retirees say that Social Security accounts for about 30% of their retirement income. Non-retirees expect Social Security to account for about 26% of their annual income. About 69% of investors say they’re confident that between their savings and Social Security, they’ll have enough money to maintain their lifestyle in retirement. 60% of investors say caution when investing in the stock market is wise because it protects people from possible market losses; 37% think it’s unwise because it prevents investors from realizing significant market gains; 3% don’t know or refused to answer the question. 68% of investors say they actively choose stocks for their long-term investment accounts, and 29% say they consciously avoid stocks in long-term investment accounts; 3% don’t know or refused to answer the question. Of the investors who say they avoid stocks, more than half (56%) say they are not confident they can reach their financial goals without stock market exposure, but they still think it’s better to avoid the risk. 51% of all investors think the market will have a correction later this year; 41% don’t think there will be a correction; 8% don’t know or didn’t answer the question. If there is a correction, 63% say they’ll ride it out and stay with their current investment allocation; 25% will see it as a buying opportunity and invest more in the market; 10% will exit the market and move money into cash; 2% don’t know or refused to answer. Retirement income strategies are not just for the super wealthy. As retirement nears, the traditional strategy has been to move growth-seeking products to more conservative, fixed-income products. According to a recent study, for a married couple age 65 there is now a 50 percent chance that at least one spouse will live to age 94. This means that you may need to plan for your retirement savings to potentially last 25 to 30 years. One drawback to a longer life is the greater possibility of outliving your savings — creating all the more reason to develop a retirement income strategy designed to last for a longer lifetime. 61% of Americans surveyed said they were more afraid of outliving their assets than they were of dying. 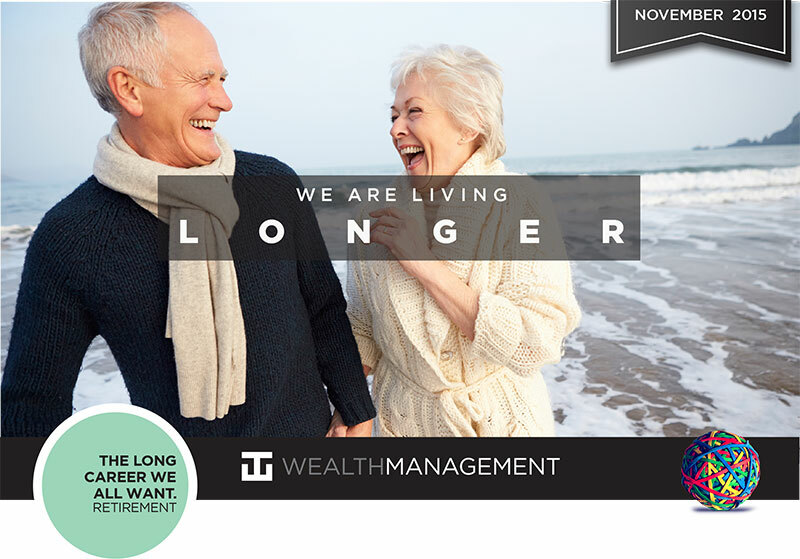 Retirement planning can be scary, however, I always tell my clients you plan now, to play later. When planning for the retirement of your dreams there are only 3 options if you are behind schedule. Save more, work longer or take more risk maybe. At WT Wealth Management we believe in downside protection more than maximum upside reward. It’s easy to forget and maybe nobody has ever pointed it out but a 20% loss takes a 25% gain to get back too even, and that could take years or force you into taking additional risks just to make up the loss. We feel the most important thing we bring to the investor is helping them understand their personal risk tolerance, it’s not about how much you hope to make, it’s about how much you can afford to lose and still sleep at night and enjoy your life. Risk tolerance assessment can be accomplished with a variety of tools, techniques and strategies, some technology based and some centered on an open and honest conversations. It should be important to every investor to find a work with an Investment Professional that is open and honest about your current financial health and won’t just tell you what he/she thinks you want to hear. There are a variety of different paths once can take before they hang up their suit and retire their briefcase before heading to the golf course or favorite fishing hole. You options are far more limited if you’ve discovered that you received less than honest advice 5 years into your retirement career.